I am trying to open a .chm file. 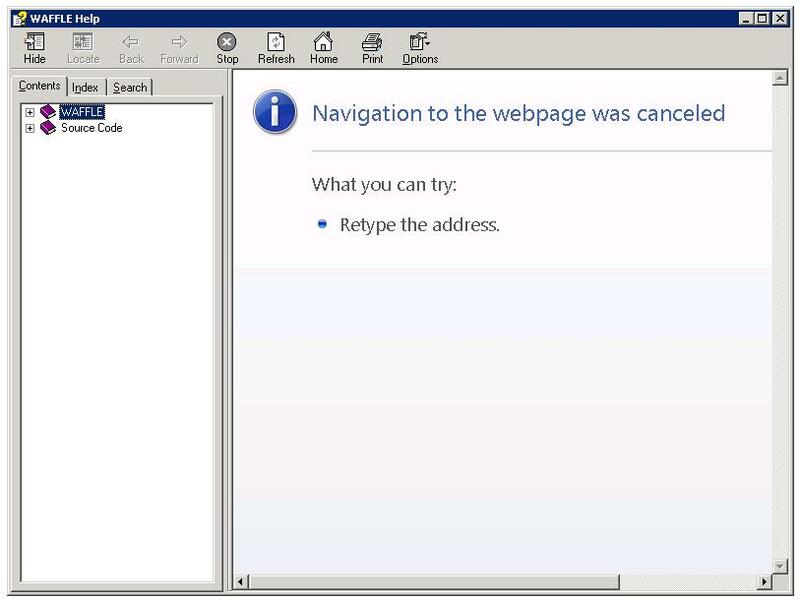 Navigation to the webpage was canceled. Microsoft Security Updates 896358 & 840315 block display of CHM file contents when opened from a network drive (or a UNC path). This is Windows' attempt to stop attack vectors for viruses/malware from infecting your computer and has blocked out the .chm file that draw data over the "InfoTech" protocol, which this chm file uses. If you are using Windows Server 2008, Windows 7, windows has created a quick fix. Right click the chm file, and you will get the "yourfile.chm Properties" dialog box, at the bottom, a button called "Unblock" appears. 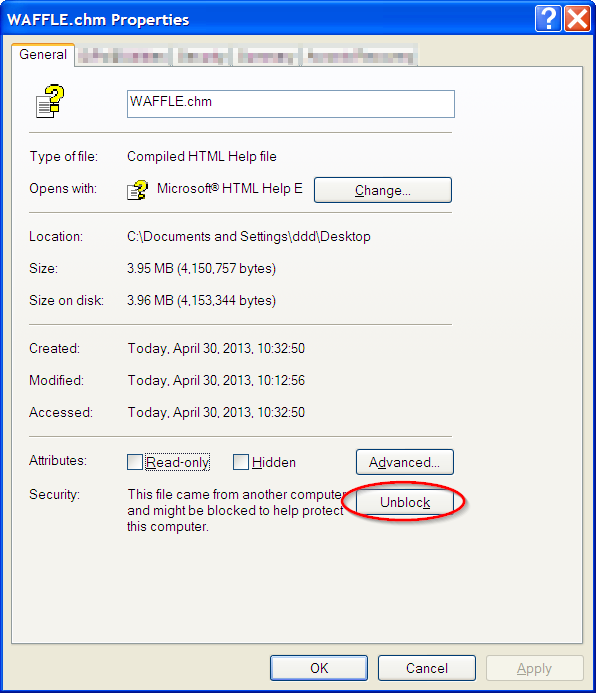 Click Unblock and press OK, and try to open the chm file again, it works correctly. This option is not available for earlier versions of Windows before WindowsXP (SP3). Solve the problem by moving your chm file OFF the network drive. You may be unaware you are using a network drive, double check now: Right click your .chm file, click properties and look at the "location" field. If it starts with two backslashes like this: \\epicserver\blah\, then you are using a networked drive. So to fix it, Copy the chm file, and paste it into a local drive, like C:\ or E:. Then try to reopen the chm file, windows does not freak out. Windows 8 or 10? --> Upgrade to Windows XP. I'm told that on non forked filesystems (like FAT32) there are hidden files, but I haven't gotten to the bottom of that yet. P.s. Delphi's DeleteFile() should also recognize forks. just move it to another folder or rename your folder (in my case: my folder was "c#"). avoid to use symbol on folder name. name it with letter. The definitive solution is to allow the InfoTech protocol to work in the intranet zone.
" DllRegisterServer in hhctrl.ocx succeeded "
Now try to open your CHM file again. I tried with SumatraPDF and it work fine. I fixed this programmatically in my software, using C++ Builder. Before I assign the CHM help file, Application->HelpFile = HelpFileName, I check to see if it contains the "Zone.Identifier" stream, and when it does, I simply remove it. There are apparently different levels of authentication. Most articles I read tell you to set the MaxAllowedZone to '1' which means that local machine zone and intranet zone are allowed but '4' allows access for 'all' zones. As an additional note, weirdly the "UrlAllowList" key was required to make this work on another PC but not my test one. It's probably not required at all but when I added it, it fixed the problem. The user may have not closed the original file or something like that. So just a consideration. I suggest try the least and test it, then add if needed. Once you confirm, you can deploy if needed. Good Luck! Edit: P.S. Another method that worked was mapping the path to the network locally by using mklink /d (symbolic linking in Windows 7 or newer) but mapping a network drive letter (Z: for testing) did not work. Just food for thought and I did not have to 'Unblock' any files. Also the accepted 'Solution' did not resolve the issue for me. Not the answer you're looking for? Browse other questions tagged windows chm or ask your own question. Why does this help file that I downloaded from the Internet only contain blank pages? How do I install and use curl on Windows?